Home » Who was Hippias, tyrant of Athens? When the tyrant Pisistratus died in 528 BC, his two sons, Hippias and Hipparchus, took over ruling Athens as tyrants. Hippias seems to have taken care of most of the politics, while Hipparchus took care of religious matters and the gods. (We hear about this in Herodotus). But in 514 BC, two young rich men named Harmodius and Aristogeiton tried to kill Hippias and Hipparchus. They missed Hippias, but they did kill Hipparchus. Then Hippias’ guards killed Harmodius and Aristogeiton. After his brother was killed, Hippias got more and more suspicious of everyone around him, and thought everyone was plotting against him. Four years later, in 510 BC, another rich man called Cleisthenes, from the Alcmaeonid family, did succeed in getting the Spartans to help him throw Hippias out of Athens. Hippias went to live with the Persians, where he spent the rest of his life. 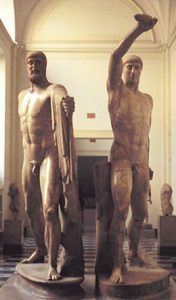 The Athenians thought of Harmodius and Aristogeiton as big heroes because they killed the tyrants, and brought in democracy. They put up these public statues of the “tyrannicides” – the tyrant-killers – to celebrate their achievement. Learn by doing: hold a debate: were Harmodius and Aristogeiton heroes? Cite this page: Carr, K.E. Who was Hippias, tyrant of Athens?. Quatr.us Study Guides, July 7, 2017. Web. April 21, 2019.